Pfaffenhofen, 29 May 2017 – ASC, the leading manufacturer of accelerometers, angular rate sensors and IMUs (inertial measurement units), has now unveiled its first tilt sensor and included it in its product range. The ASC TS91V1-090 is a uniaxial sensor in an aluminium housing, with stand-out features including its high resolution (0.005º) and operability over a wide temperature range. This means it is perfectly suited for measuring angles in construction, the agricultural sector and that of renewable energies as well as in rail and automotive sectors. The ASC TS91V1-090 tilt sensor, which leverages MEMS technology, is available as both a uniaxial and biaxial configuration, and measures statically from +/- 90 degrees. The sensor is available in aluminium housing with protection class IP67 or in a stainless steel housing and protection class IP68 when more demanding usage requirements are imposed, for which hermetic tightness must be guaranteed. 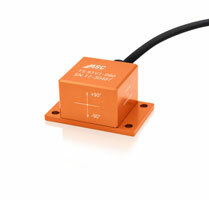 The ASC tilt sensor can measure in both horizontal and vertical directions. The new ASC TS91V1-090 includes both a high shock limit of 5000g and an effective temperature coefficient from the offset of 0.02/ºC. The sensor also boasts a long-term offset stability of 0.1° per year and can be used within a temperature range of -40 to +120°C. The TS91V1-090 and its differential analogue output can be supplied with voltage ranging from 6 to 36 VDC. The ASC TS91V1-090 is supplied either factory-calibrated or, upon customer request, with DAkkS calibration. The sensor measures tilts and is mainly used for the purpose of preventing accidents as well as for monitoring systems. For example, it supports the task of systematically monitoring cranes to prevent any tilt or inclination. Meanwhile, within solar fields, the sensor can be used to determine the right angle at which to align the solar module with the sun. The new ASC sensor also has scope to control the tilting of bridges. Plus, it also functions to control the horizontal and vertical positional determination of ships and their cargo. In the vehicle and rail sectors, the sensor is used for wheel alignment and track alignment respectively. Construction is another possible area of use. In this respect, and with operational safety in mind, the tilting of vehicles while in operation is monitored, for example diggers, tipper vehicles and working platforms. “We are more than happy that the ASC TS91V1-090 has allowed us to add a further top-quality sensor to our product range. The tilt sensor has wide-ranging applications and paves the way for our customers to monitor their machinery and equipment reliably. Depending on the requirement, we offer the sensor in a range of configurations”, says Renate Bay, Managing Associate at ASC. ASC prioritises the task of developing bespoke solutions and thus adapts the sensor plugs and cables to their respective requirements. This means customers have access to the full range of service features including maintenance, repair and calibration. The ASC GmbH company is headquartered in the Bavarian town of Pfaffenhofen and is one of the world’s leading manufacturers of capacitive and piezoresistive accelerometers, angular rate sensors (gyroscopes) and IMUs (inertial measurement units). In addition to providing standard sensors, ASC is particularly specialised in designing customised solutions geared exactly to the needs of the customer. These customised solutions can be produced even in small production runs. ASC products are used in very wide-ranging industries, including automotive, railway vehicles, wind energy, monitoring, agricultural and aviation. Leading companies worldwide such as Alstom, Audi, AVL, Balfour Beatty, Bauer AG, Beijing Environment Institute, BMW, Continental Safety Engineering, Daimler, DB Systemtechnik, Fiat, Honda, Hitachi Rail, Hyundai Motors, iABG, imc, Ipetronik, Italcertifer, Iveco , John Deere, Lufthansa Technik, Magna Steyr, MAN, MTS, Opel AG, Siemens AG, Strainstall, TIZ Landl, TÜV Süd Rail, Volvo, VW and Wölfel rely on ASC products. In April 2013, ASC GmbH accredited the German Accreditation Body (DAkkS) to provide calibrations of accelerometers in accordance with DIN EN ISO/IEC 17025:2005. The company offers additional services such as maintenance, repair and calibration for proprietary and third-party products. ASC also markets accelerometers produced by the company Honeywell, and angular rate sensors (gyroscopes) produced by Systron Donner Inertial in Germany, Austria and Switzerland. Further information can be found on the website at www.asc-sensors.de.